Product information "MIF (human recombinant)"
Macrophage Migration Inhibitory Factor (MIF) is a small, pro-inflammatory cytokine. MIF signaling is important in septic shock, arthritis, colitis, and cardiovascular diseases. MIF counteracts glucocorticoid signaling, which would otherwise inhibit inflammation. Secreted MIF binds to CD74 receptors, which then couple to CD44, during monocyte recruitment. In addition to CD44 binding, MIF is an enzymatically active keto-enol tautomerase that is inhibited by isothiocyanates such as sulforaphane. Overexpression of MIF has been seen in several cancers. MIF overexpression has been shown to promote hypoxia induced HIF-1alpha stabilization leading to changes in the tumor microenvironment, including stimulation of angiogenesis and neovascularization. 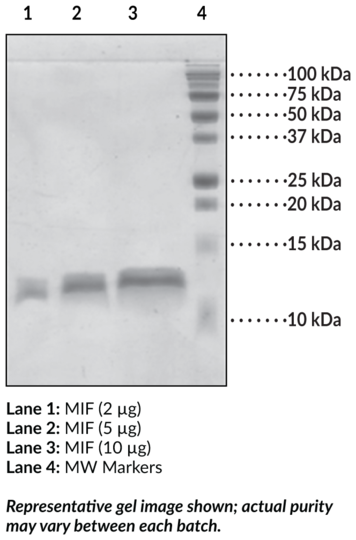 Customer review for "MIF (human recombinant)"